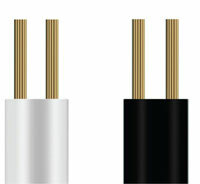 Soft Annealed Copper Conductor Single Core, Thermoplastic Insulated From Size 1 mm2 to Size 10 mm2. Stranded From Size 1 mm2 To Size 50 mm2. 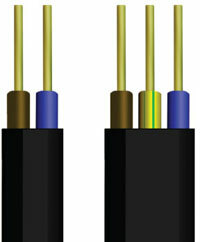 PVC Rated 70 co Permanent & 160 co Short Circuit. Black, Red, Yellow, Green , Brown , White, and Yellow - Green. Equipment Wiring, Lighting Fittings, Distribution In Or Under Plaster, For Distribution Station. In 100 YDS or 100 Meters Coils. For Connecting Light Protable Appliances Such As Lamps, Tv Sets,Table Fans, Door Bells. Soft Annealed Bunched Copper, Wires Flexible. Used For Low Current Machinary,electrical Appliances Control Cable & Boards.such As Control Panels, Elevators, T.V & Satellite Rotator Motors. Every Job Site Equipment, Motors, Pumps, Low Current Machinery. 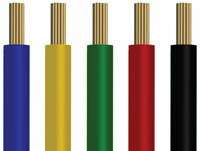 PVC Coloured Rated For 70 co.
PVC Sheathing White Or Black Coloured Rated For 70 co. In 100 YDS Or 100 Meters Coils Or On Drums. Soft Annealed Solid Or Stranded Copper Wires. With Or Without Earth Continuity. 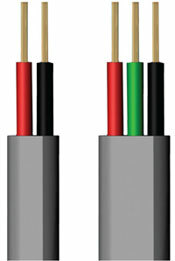 PVC Rated For 70 co Permanent & 160 co Short Circuit. PVC Grey Colour (black Or White Upon Request). Indoor Wiring In Walls On Boards Used For Appliances Wiring, Switching & Distribution of Electrical Power. Soft Annealed Flexible Stranded Copper. Black, Red, Yellow, Blue , Brown. Suitable For Inside Appliances & In Lighting Fittings And Control Panels & Boards. The Cores Are Laid Side By Side And Framed With PVC Sheath. 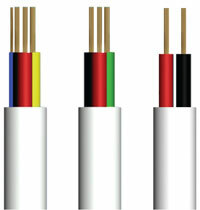 For Wiring In Dry Conditions For Permanent Laying In Plaster And Under Plaster. Green, Gray, Orange, Violet, Light Blue, Deep Green. private telephones & electrical intercoms and inner phones. 100 YDS coils. (Drums Upon Request).